While you’re busy preparing your holiday gift list, we want to remind you think about one person you may have forgotten — yourself! Maybe orthodontic treatment isn’t the first thing you think of around the holidays, but we think there’s never been a better time to take the steps to enjoy a better smile. At Complete Dental Care, Dr. Kostas is happy to provide Six Month Smiles for our Burlington neighbors. It’s a subtle orthodontic solution for straightening out the teeth that show when you smile! If the treatment for traditional braces lasts more than a year, then how can Six Month Smiles work in less than half the time? Unlike conventional orthodontics, which overhaul a misaligned bite, this accelerated treatment focuses on making cosmetic improvements to the teeth that show when you smile. By quickly shifting the teeth in the “smile zone,” Six Month Smiles offers a faster solution to crowded, gapped, or uneven teeth. And its clear brackets and wires do so without noticeable hardware interfering with your confidence in the meantime. Brackets and wires are practically invisible for full smile confidence throughout the treatment. Faster doesn’t mean painful — Six Month Smiles uses low forces to comfortably shift teeth into the proper position. Six Month Smiles is usually more affordable than other acccelerated or invisible orthodontic options. Faster treatment means you’ll be back to eating, brushing, and flossing like normal before you know it. Are you a good candidate for Six Month Smiles? Schedule an appointment with your dentist at Complete Dental Care to discuss the efficient orthodontic treatment. When you do, we will take a few things into consideration to determine the best method for straightening out your teeth. Remember that Six Month Smiles is used to make cosmetic improvements to a smile. Serious dental misalignments, like overbite, underbite, or crossbite, require longer, more complex treatment. These cases are usually best treated by traditional metal braces. Keeping up with your excellent dental hygiene is important throughout any orthodontic treatment. Take some time to learn how to properly brush and floss your teeth with Six Month Smiles to enjoy a healthy smile throughout your treatment. 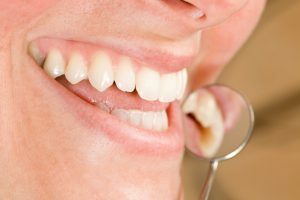 Your dental hygienist can help you master a good technique — and once you’re in the habit, you won’t think twice about brushing and flossing with Six Month Smiles. Treat Yourself This Holiday Season! Maybe you never thought you’d treat yourself to clear braces, but we think it’s a great idea — especially during the season made for gift giving. You deserve straight teeth and a confident, beautiful smile! Please get in touch with Complete Dental Care to discuss what’s possible with invisible braces today!